Country Living at its finest! 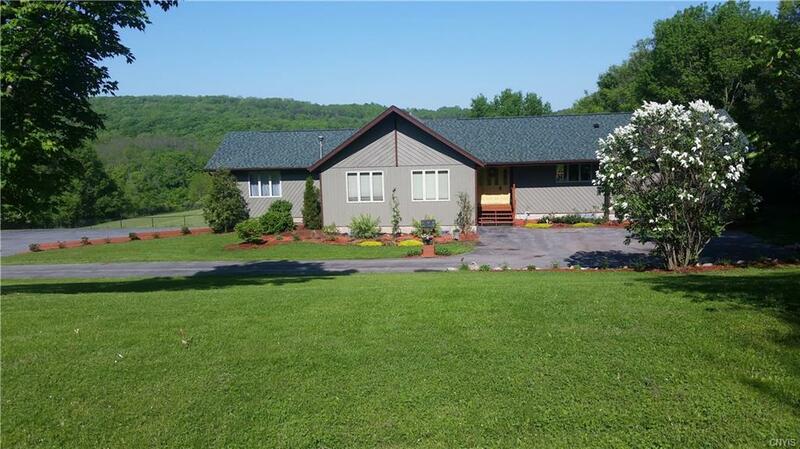 Located only 3 miles from Cazenovia Village, this 5 bd 3 full, 3 half bath hillside ranch offers imposing view of hills of Fenner-so beautiful every season of the year! The fully remodeled kitchen (fall 2016) is just beautiful-so light and bright and well conceived. The living room with its wall of windows may become your favorite room in the house! Lower level could be in-law apt. and offers kitchenette, 2nd family room, 2nd laundry, 2 bd, 1.5 bath. Hobbyist's Dream Come True-50x52 pole barn has been used for building airplanes and is complete with electric, water and insulation. Suitable for storage, multi-car garage as well. Home office potential. New roof 2015, exterior painted 2017, new full & half baths as well in 2018. 2 fully fenced in acres, backyard.